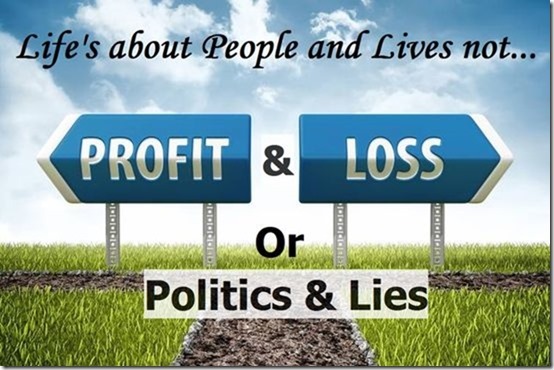 You and I probably can’t do anything about Profit & Loss, Politics & Lies however we can make a difference in the individual lives of those People and Lives (you and I included) who have become “collateral damage”. I’ll let the apostle Paul tell you what you and I can do. “All praise to God, the Father of our Lord Jesus Christ. God is our merciful Father and the source of all comfort. He comforts us in all our troubles so that we can comfort others. When they are troubled, we will be able to give them the same comfort God has given us.” (2 Corinthians 1:3-4 NLT) Because we are been-there-received-God’s-blessings-Christians the Holy Spirit makes it possible for us to help people experience the God given value in their lives.